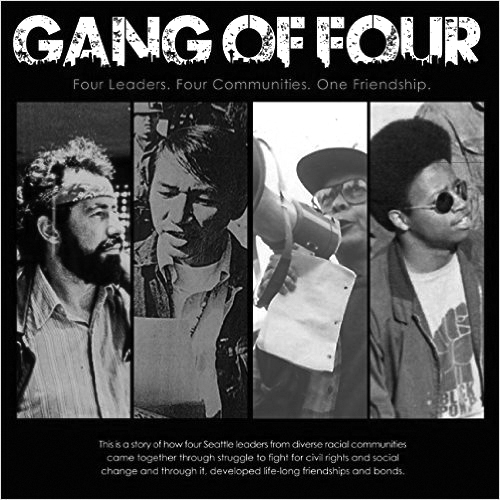 The Roberto Maestas Youth Leadership Institute will be hosting a book signing and discussion panel on the newly released book: “Gang of Four: Four Leaders, Four Communities, One Friendship” at El Centro de la Raza on Wednesday, December 9. The event will take place from 5:30-7:30 p.m. It will be held at the El Centro de la Raza Dining Room, located on the bottom floor of the building, 2524 16th Ave. S., Seattle. The discussion panel will include members of the Gang of Four: Bob Santos, Larry Gossett, Estela Ortega in place of member Roberto Maestas, and Laura Wong Whitebear in place of member Bernie Whitebear. The panel will be joined by guest moderator and radio personality Tony B. There will be a Street Taco Buffet, Pan Dulce and Agua Fresca. Autographed books will be made available for purchase on location.